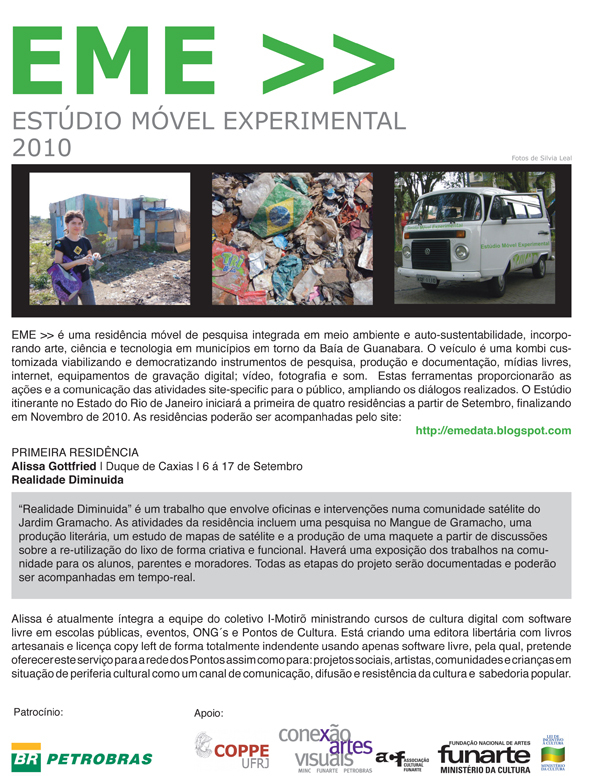 EME >> was awarded the Conexao Artes Visuais prize in 2010. The commission supported four mobile residencies around the guanabara bay region of Rio de Janeiro, with work that approached directly the environment with investigations of the atlantic biosphere in the region. The van became a place for the work of art, science and technology to meet, and for artists to immerse in field – research and develop public showcases with site-specific interventions and workshops, allowing for a variety of instances of participation. The 2010 edition involved 31 professionals and reached around 600 members of the public directly, over 7000 indirectly with 16 public interventions and workshops. This entry was posted in Residency and tagged Active Ingredient, Alissa Gottfried, Beatriz Lemos, Brasil, Conexões Artes Visuais, EME >>, Funarte, Ministerio da Cultura Brasi, Petrobras, Romano, Silvia Leal, UK. Bookmark the permalink.